Christmas is upon us and this year Santa’s got a special present for all cinemagraph aficionados! We’ve created a tool you can use to send Christmas eCards containing cinemagraphs to your loved ones and colleagues (click HERE to try it). And since “‘tis the season for giving,” it’s free to use! Ho ho ho. Choose from a selection of Christmas-themed Cinemagraphs for your eCard! 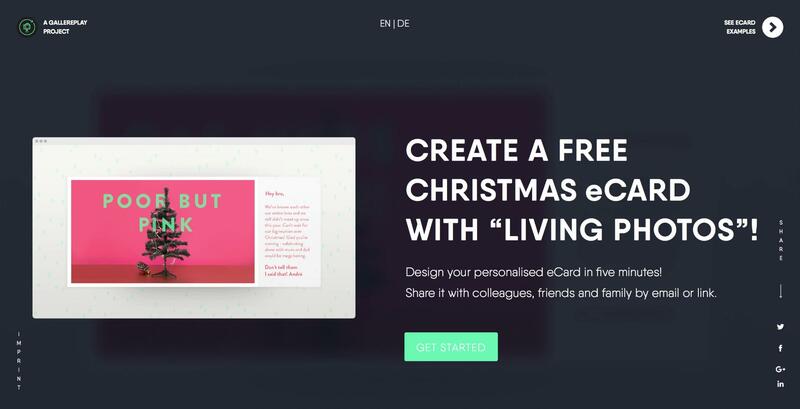 The eCard design is customisable: you can choose from seven carefully composed Christmas cinemagraphs ranging in tonality from “classic” to “edgy”. There are a variety of color schemes to select from and you can enter a personalised message to accompany your cinemagraph of choice. Your final design can be sent to one or more recipients via email, or shared via link. eCards have been around since 1994, yet they’ve struggled to replace paper cards. Research shows that the majority of people still prefer to receive a physical greetings card. Our gallereplay Co-Founder Lydia Dietsch, who spearheaded the project, believes that cinemagraphs and good design can help change this. So why not put a smile on someone’s face this holiday season and spread the word about cinemagraphs in the process? Have fun exploring the tool and let us know what you think. Happy Holidays everyone! Want to see more cinemagraphs? Check out our 10 most engaging Christmas cinemagraphs or browse our collection. Hei, I’m Mira! A Finn living in Berlin, who enjoys the city’s music scene and cafes. But most of all the inspirational people. As gallereplay's Community Manager I get to learn and create daily within the world of cinemagraphs - this unique medium. You’ll find me either on a bike, film photographing or running on tracks.